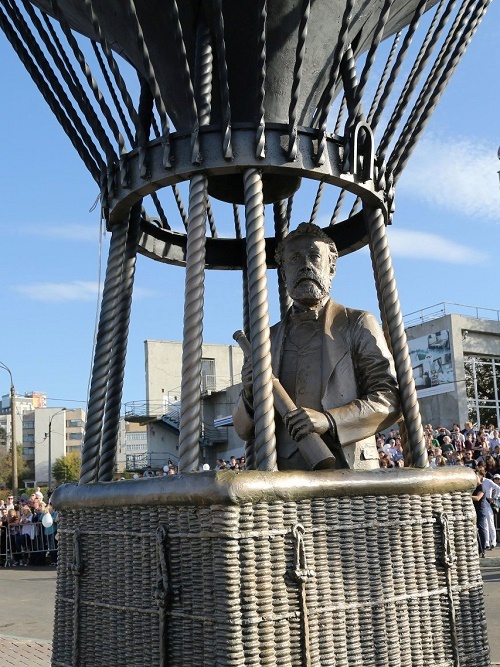 French science fiction writer Jules Verne monument appeared in Nizhny Novgorod, Russia 27 September, 2015. Meanwhile, made of plastic painted in bronze color, the monument to the great French writer became the first installed in Russia. The sculptor depicted Jules Verne flying in a hot-air balloon, and in his hand he is holding a Spyglass. The figure of the writer in human growth stands in the basket of a balloon. Together with the balloon, the monument is a composition about 10 meters high. The sculpture was installed on the initiative of a construction company, which has a housing complex in the city, named after a French writer. Books share with us the experience and knowledge of previous generations, demanding nothing in return, except careful treatment. Undoubtedly, beading books makes us smarter, more literate and more intelligent. Indeed, the book makes a person think, broadens his horizons. Moreover, the book can help cope with the so-called computer and game addiction. Books can captivate with the colorful and mysterious world of adventure, fantasy, and novels. But the main thing, it enriches our spiritual world. Accordingly, Man, in gratitude to the book, dedicates monument to it. 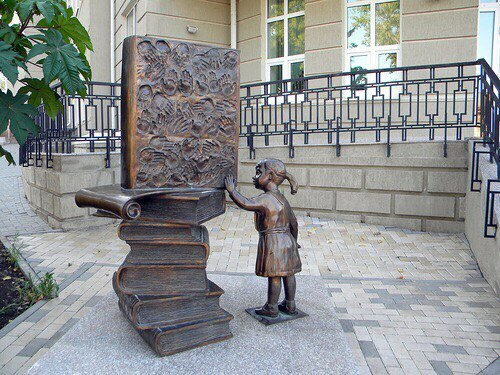 So, the monuments dedicated to books and reading, are found all over the world. In particular, in Russia there are several such monuments. Poet Joseph Brodsky monument appeared near the house 18, Novinsky Boulevard on May 31, 2011. The work of sculptor Georgy Frangulyan and architect Sergei Skuratov. Noteworthy, the sculptor worked on the monument for 7 years and created it at his own expense. 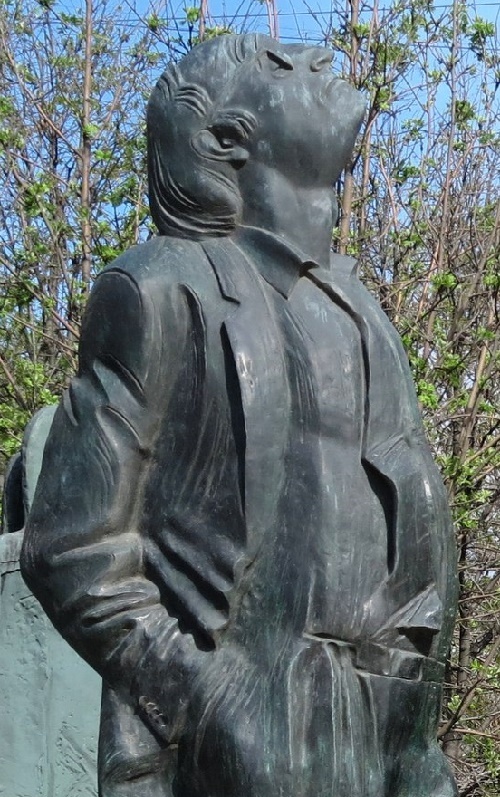 According to the sculptor, the monument to Brodsky is his personal gift to the city. “Everything, completely: a pedestal, a granite, and a sculpture,” the sculptor said. Meanwhile, the idea of the composition is also interesting. Against the background of 12 faceless figures, divided into 2 groups, which seem to be the symbol of the split society, the 13th – the figure of the poet stands out. Brodsky looks up at the sky, as if not noticing what is happening on earth. According to the plan of the sculptor, against the background of many people it is possible to “stand out” only to a few people. And this was Joseph Brodsky. 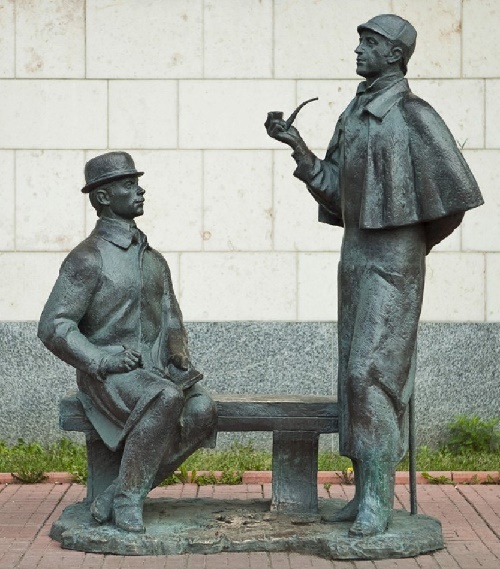 Monument to the heroes of works of Arthur Conan Doyle – detective Sherlock Holmes and Dr. John Watson appeared on the 120th anniversary since the publication of the story “A Study in Scarlet.” The hero has the features of Vasily Livanov and Vitaly Solomin, who played these characters in the Soviet TV series. Incidentally, the British Queen Elizabeth II bestowed the leading actor Vasily Livanov Order of the British Empire. 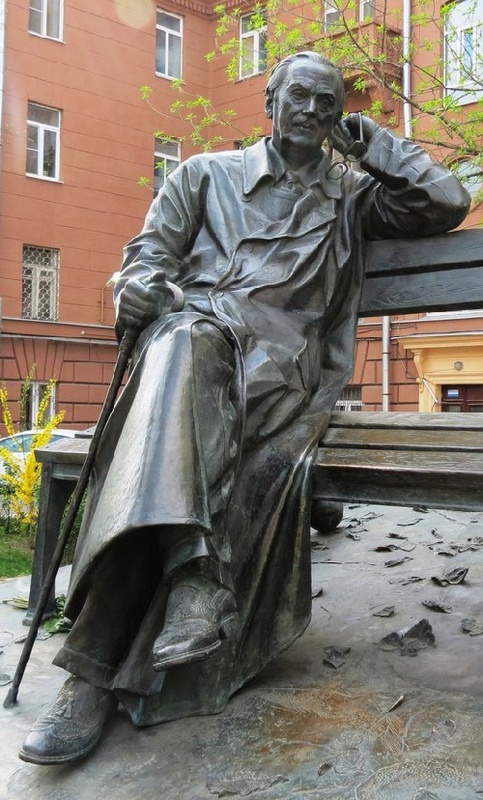 The author of the monument sculptor Andrey Orlov, who created the images of the characters based on the works of Sidney Paget – the first illustrator of stories about the adventures of Sherlock Holmes. Cast in bronze, the world-famous characters of Sherlock Holmes and Dr. Watson are standing next to the Embassy of England. On the opening ceremony the actor Vasily Livanov joked that if to touch notebook of the doctor, many problems will disappear. But to touch the phone of the detective is not necessary – there will be problems with the law. 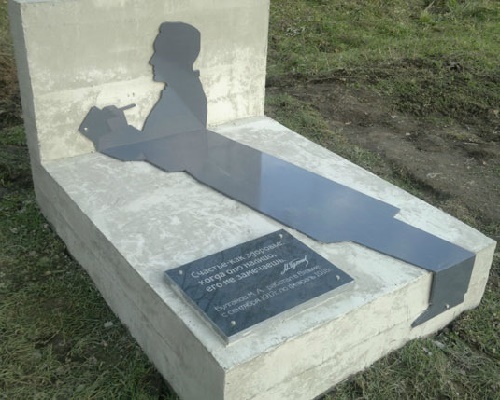 An unusual monument to the famous Russian mystic writer Bulgakov appeared in Vyazma. The memorial sign shows the shadow of the writer, and this is the world’s first monument to a shadow. Next to the shadow is a plate with the inscribed words, from his story “Morphine”: “Happiness – as health, when you have it, you do not notice it”. The appearance of this unique monument is not accidental. From September 1917 to February 1918 Mikhail Bulgakov worked there as a country doctor. He described the impressions about staying in the Smolensk region in a series of “Notes of a young doctor.” However, no material evidence about the life of the famous writer and playwright in Vyazma preserved. Anyway, the idea of ​​perpetuating his memory in the city where he lived and worked, appeared long ago. “Two years ago, representatives of the Moscow cultural and educational center “Bulgakov’s House” unsuccessfully sought traces of the writer in Vyazma. Then the representatives of the “Bulgakov house” literally demanded to restore the writer’s name in the history of the city. According to city officials, the concept of the monument most faithfully reflects the “transience” of Bulgakov’s stay in the city. 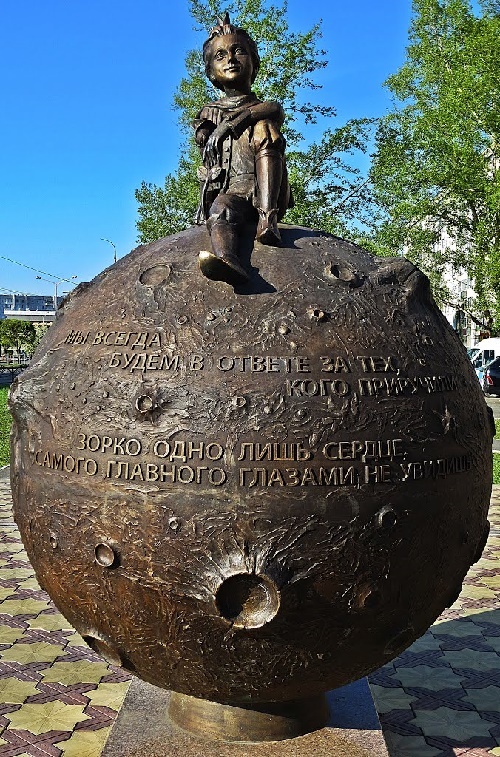 Sculpture “The Little Prince” appeared in Abakan in July 2013. Its author – sculptor from Krasnoyarsk Andrey Murzin. Sculpture depicts little prince, who is sitting on his planet and looks into the distance, his scarf sways in the wind, and in the hands – a rose. It is interesting that the planet is a hollow bronze ball outside resembling our moon – with irregularities, craters and volcanoes. The Little Prince himself completely cast in bronze. The whole composition weighs about a ton and set on a square granite pedestal. Since the sculpture is small and very nice, it is not surprising that it has caused such excitement among the kids. And, of course, appeared a tradition – to rub shoe of Little Prince, then make a wish, which will be fulfilled. In addition, the inscription on the ball reminds all passersby that it is necessary to be responsible for the world, our planet, loved ones, and those we have tamed. May 28, 2014 Vladimir Vladimirovich Putin personally took part in the opening of the monument to Sergei Vladimirovich Mikhalkov (March 13, 1913 – August 27, 2009). The monument was installed on Povarskaya Street in the square between the houses number 33 and number 35/28: next to the house where he lived a long time, and in front of the International Community of Writers’ Union, which he headed. The sculpture was created by People’s Artist of Russia Alexander Rukavishnikov, author of Moscow monument to Fyodor Dostoevsky, Mstislav Rostropovich, and Yuri. The members of the family of the writer: Andrei Konchalovsky, Nikita Mikhalkov and Yulia Subbotina attended the opening ceremony.